Welcome to this special meeting of the Society, our ninth meeting, called by me, the self-appointed president. For new members, please feel free to acquaint yourself with the Society in general by reading previous Society meeting posts. At today’s meeting, we have another Important Matter to consider, perhaps the most important matter here-to-for discussed. And then after we discuss this Important Matter, I, your Society president, will present a brief program on dwarf bearded irises. As your president I have thought for some time that the Society name is a bit long and shall we say, unwieldy, perhaps even limiting for a membership that has interests in such a wide array of topics related to gardening. I therefore am presenting a motion to change the name of the Society for the Preservation and Propagation of Old-Time Gardening Wisdom, Lore, and Superstition to a new name that offers both meaning and an easy to remember acronym. After much consideration, contemplation and cogitation, I hereby move that the name of the Society be officially changed to “Blooming United Gardeners Society”, which can be referred to as BUGS or just “the Society”. Please discuss this motion amongst yourselves via the comments, and don’t be shy about offering other suggestions. Following discussion, the name changing committee will decide if there should be a vote or if this motion will be automatically “so moved”. Instead, I found myself at a local greenhouse, saw the dwarf irises blooming, and bought them. The first time this happened, I bought Iris ‘Variegata’, which has variegated leaves and is not pictured because it is not currently blooming, and another variety called ‘Smart’. I love the deep, dark purple color of ‘Smart’ in early spring. Then the next year, I was back at the same greenhouse and bought two more dwarf irises, just because I thought they would go well with my first purchases. This one is called ‘What Again’. Many of you might have said "What Again?" when you saw that this was another Society post. I guess that’s what a glowing fireplace ember would look like, as interpreted by an Iris. I’ve not been to that greenhouse yet this spring, but I imagine I’ll be drawn there soon, perhaps this weekend, by forces I can’t control. 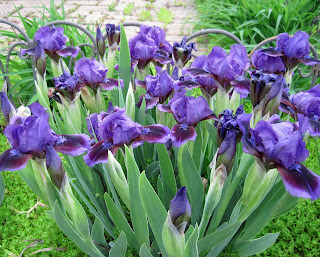 Once I’m there, I might see another dwarf bearded Iris or two and I might accidently buy them, too. So far, these have been easy to care for. I’ve planted them and removed the spent blooms, and that’s about it. The nice thing about these irises is they don’t get top heavy and fall over and they seem to bloom earlier than bearded Iris. Individual blooms only seem to last a day or two, so I try to deadhead them every few days. Once these irises finish blooming, you end up with a nice little clump of Iris foliage which blends in nicely with summer flowering perennials nearby. I’ve not tried to divide these irises yet, but when I do, I'll probably divide them like I would other bearded irises, which is done in late summer. It looks like 'Smart' and maybe 'What Again' are big enough to divide this year. This concludes this meeting of the Society. Please remember to weigh in on the name change motion via the comments. I don't think BUGS contains the heart of what the Society is. Superstition and Lore United Gardeners Society would be much better or SLUGS for short. Hello Madame Pres., while your ideas are always first rate, I kind of liked Spotgals, although it did seem to leave out the Spotguys. Whatever the majority goes with is fine by me. Now about those little iris, they are just fabulous. The colors are fantastic, especially What Again?. Mine are all a very dark reddish purple, passalongs from neighbors. I love the diversity you have! I've belonged to the American Iris Society for years but never have been active and never have gone crazy about iris. When I was a kid the old farm house my dad bought was literally surrounded by iris, hence my interest. They are an easy plant, bloom early and multiply well. They seem to bring on lots of comments from visitors too. Thanks for the pictures. I have some short iris plants, I believe they are the dwarf bearded, but don't know for sure as they have never (yet) bloomed for me. They were tiny little rhizomes when they were first passed along to me, and they didn't seem to thrive in their first location here, so I moved them last summer and they do seem happier. Well Madame President, I will second or third the motion of the name change to BUGS. We all have em, we all discuss them so it would be easy to remember. Love those short little irises. I will have to look for some of those. Hi! I liked the photos of the iris, but I'm wondering what you have planted around them. It looks like a low, spreading ground cover of some sort. Pretty contrast. BUGS! BUGS! I think I like SPOTGALS better. I'm usually fighting bugs in the garden, and I don't really want to be one, unless of course, I'm a lady beetle. O.K. I've calmed down. I'll just tell myself I'm eating aphids off the roses. Carry on Madame President. I suspect no matter what we say, you'll exercise your right as President for Life to make the final decision! What's that old saying? "You can call me anything but Late For Dinner." Even BUGS. 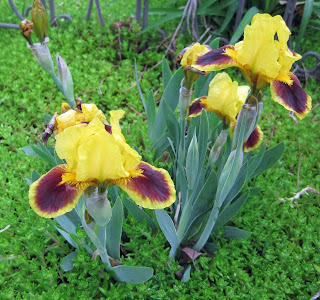 Oh, Carol, the dwarf bearded iris called 'Smart' is such a sweetie! 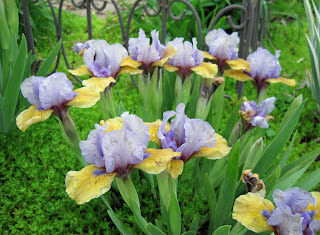 Reading about your iris sent me back to my Illinois garden diaries and the old photo album. I thought you might like to see the lists and a few photos so there is now a nostalgic iris post on Annie's Addendum. Those Irises are so cute! I especially like Smart & What Again. While I like BUGS, I have another suggestion: how about SEEDD, the Society of Eccentric & Exciting Dirt Diggers? It's not that I dislike change... But I really do prefer "The Society for the Preservation and Propagation of Old-Time Gardening Wisdom, Lore, and Superstition" It's so Charles Dickens, like something right out of the Pickwick Papers. I would be sad to see such a lovely name go. So glad to see that the irises are starting to brighten up you part of the world. Your Irises are great....since I'm new to this whole society thing, I'm going to sit back and watch for awhile. I'm always lovin' those mini Iris. THey are so cute, and they don't fall over, and they multiply like crazy, and I have 4 or 5 new ones I'm waiting to see bloom ... any day now!! yippee...! I was just at my favorite local nursery and fell for "What Again?"! She's a cutie. I have a number of small irises of one sort or another and they are all excellent, no problem plants. Hmmm, Bugs? I think I may be a SPOTGALS kind of gal myself.